As many of you know, I am leaving SSA this summer to become the Dean and Paulette Goddard Professor at the New York University Silver School of Social Work. It has been an enormous honor and privilege to serve SSA, and to contribute to elevating its stature and impact as one of the world's leading schools of social work. After eleven years as a faculty member and seven as Dean of SSA, I will miss so many outstanding colleagues, students, and friends. And I'm delighted to have the privilege of continuing to serve the field and profession in my new role in New York City. 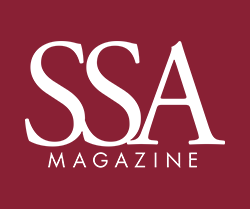 Because of SSA's superb faculty, staff, students, and alumni, we have accomplished much during my time here—and yet there is much important work yet ahead. Some of SSA's most notable and recent efforts reflect our deep commitment to inclusion, access, and social justice issues. Underscoring our commitment to access, SSA sought and received University approval to "ban the box"—removing questions about prior felony convictions from our application form, thereby removing a significant roadblock in SSA applicants. Our faculty also enthusiastically backed our DACA (Deferred Action for Childhood Arrivals) students who face immigrationrelated concerns—initiating a special scholarship fund to offset these students' financial burdens as they complete their SSA studies and face uncertainties about their future. Assistant Professor Angela García, whose research examines international migration, urban sociology, and the marginalization of immigrant groups, led the faculty's efforts on behalf of our DACA students. This campaign helped to fuel the success of the University's Giving Day efforts, which resulted in a record number of gifts to SSA in support of our students. At a more grassroots level, eight SSA students spent their spring break as volunteers with CARA's Family Detention Pro Bono Project. CARA, a coalition of four immigration organizations, works to ensure that detained children and their mothers receive pro bono representation, and serve as advocates to end the practice of family detention. Working with CARA, our students provided support at the detention center in Dilley, Texas. This privately-run detention center (located 80 minutes from San Antonio) has held, since 2014, thousands of women and children from Central American countries who are fleeing violence and hardship in their home countries. Through this inaugural effort, our students helped raise awareness about the government's current detention policies and practices, and their harsh consequences. Lecturers Jessica Darrow and Stan McCracken led a self-care workshop for the students before their trip and held a debriefing session upon their return. A follow-up program presented by the students included personal stories about their experience, perspectives about the plight of asylum seekers, and efforts to challenge current policies. We applaud our students’ efforts, and hope this week of service will become a School tradition that the entire SSA community will support. Another event, “Grief as Resistance: Racialized State Violence and the Politics of Black Motherhood in the Americas,” threw light on an international movement of women who have lost children to police or state violence. This program, co-organized by Assistant Professor Yanilda González, explores the consequences of violence and inequality, and the relationship between citizens and state institutions, especially in Latin America. During an open community forum, mothers from the US (including Geneva Reed-Veal, mother of Sandra Bland, who was found hanged in 2015 in a jail cell in Texas three days after a traffic arrest), Colombia, and Brazil described how they transformed grief into activism, as well as the global commonalities of state violence, and the most effective strategies in advocating for reform. This spring SSA had the pleasure of hosting Trevor Noah, host of The Daily Show. Noah, known for his comedic talent and keen skewering of social hypocrisy, also is amply gifted as an author. In a lively conversation with SSA postdoctoral scholar Shantá Robinson, Noah revealed a more serious side—sharing memories detailed in his bestselling book Born a Crime: Stories from a South African Childhood, answering audience questions, and commenting on inequality, racial identity, and human resilience in the face of injustice—issues that deeply concern our profession. We also honored several SSA trailblazers—Dolores (Dodie) Norton, Samuel Deutsch Professor Emerita, Inabel Burns Lindsay, AM ’37, Esther Nieves, AM ’87, and Frank P. Hixon Distinguished Service Professor Charles Payne—transformative leaders who have made indelible contributions to the field. During a moving discussion, moderated by journalist and educator Sylvia Ewing, panelists described the impact of these SSA pioneers. Celebratory banners of these leaders now hang in the SSA lobby, reminding and motivating all who walk through our doors. Most recently, SSA was deeply honored to host civil rights icon Rep. John Lewis and Andrew Aydin, co-authors of the award-winning graphic novel trilogy March, at the Seminary Co-op and Rockefeller Chapel, where they shared inspiring stories about activism and moral leadership. We also were delighted to welcome Valerie Jarrett, former Senior Advisor to President Obama and former SSA Visiting Committee chair, who shared her unique insights on public service, resilience, and leadership at a lunchtime conversation with our 2017 SSA graduates. As the academic year ends, we want to underscore the achievements of Charles Payne, who leaves SSA after a decade of remarkable scholarship and service. As an expert in urban school reform, social inequality, and modern African American history, Professor Payne has helped define the conversation about school reform and social justice. He has been a courageous “first responder” as the former Chief Education Officer for the Chicago Public Schools and as acting executive director of the Woodlawn Children’s Promise Community. Professor Payne not only examined and raised issues about education reform, the civil rights movement, and social disparities, he put his ideas into action. We are indebted to him for his inspiring leadership and fearless examination of social issues. The SSA community also owes a great debt of gratitude to Peter Darrow, who ends his tenure as chair of the Visiting Committee after serving for seven years. Peter’s sage and dedicated leadership helped guide the School as we embarked on SSA’s most ambitious fundraising campaign and significantly fueled our strategic initiatives. I am personally most gratefulfor Peter’s wise and generous counsel through the years, and will always appreciate his support, thoughtfulness, and ongoing deep commitment to SSA. I leave SSA humbled and extremely thankful to have had the opportunity to serve and work alongside such a stellar community of faculty, staff, students, and alumni. An interim dean, who will soon be announced, will assume leadership responsibilities while a search to appoint a new dean for SSA progresses. During this transition, you can be confident that SSA will continue its upward momentum and, with your support, will continue to raise the bar in the profession—training innovative leaders and generating breakthrough research that transforms the lives of thousands. To the entire SSA community—my most heartfelt gratitude. I will look forward to continued work alongside you, now from another great university, to support the important work that we share ahead. Neil Guterman, MSW, PhD, is the Dean and Mose & Sylvia Firestone Professor in the School of Social Service Administration.